Garey High School graduate Vincent Velasquez of the Lancaster JetHawks is the first California League Pitcher of the Week of the new season. Velasquez, 21, appeared in three games. In 13 innings he gave up just three hits and one earned run while striking out 16. He spent most of 2013 in the Houston Astros Low-A affiliate but earned a promotion late in the season to Lancaster. Velasquez appeared in three games for the JetHawks late last season, going 0-2 with a 6.14 ERA. He has obviously learned well. His numbers this season are even more noteworthy, given that two of those three appearances came in hitter friendly Lancaster. Velasquez, 6-foot-3, right-hander, is the Astros No. 9 prospect according to Baseball America. D.G. Elmore is back in control of the Bakersfield Blaze of the California League, reclaiming ownership of the franchise he operated for seven years after a bid by new local ownership to build a new ballpark for the club crumbled last week. New owners Chad Voiland and Gene Hathaway bought the Blaze from Elmore for an undisclosed price in March 2012, with the intention of building a new stadium to replace 72-year-old Sam Lynn Ballpark. The pair managed to raise just $18 million of the $30 million they said they needed for the project, however, and called off the project last week. Elmore said the new owners failed to make a loan payment that was due Oct. 1, reverting control of the franchise back to him. Voiland and Hathaway said they simply exercised an option in the purchase contract to sell the team back to Elmore at the original sales price if they could not secure a new home for the team. Either way, the team is back under Elmore’s control, with its future in the city looking doubtful. “I had every hope that Gene and Chad would build a great new ballpark for the Bakersfield community,” Elmore said in a press release. Where the franchise goes from here is uncertain. Continuing at Sam Lynn Ballpark is not an option, California League president Charlie Blaney has said, as the stadium no longer meets Minor League Baseball facility standards. Blaney told the Bakersfield Californian that he will search for other markets within the league footprint, but a shortage of public money to use for local construction projects in California makes finding a location a challenge. Last week, Blaney said the league has not considered revisiting a previous plan to shift to franchises to the high Class A Carolina League. Some of the decisions the Angels have made are dumbfounding. Here’s another one. Despite winning the High-A California League Championship, the organization has severed ties with Inland Empire manager Bill Haselman and pitching coach Brandon Emmanuel. The organization has done very little right at the major league level the past few years, one would think they’d reward those that did a superb job at the minor league level. Well, think again. The Sixers had a very unique team chemistry. All teams say they have it but this team REALLY had it. It was obvious in watching the team as much as I did this season. Players had nothing but good things to say about the coaching staff. One player even told me at the end of the season he would rather NOT get promoted to Double-A because he enjoyed playing for this team and coaching staff so much and wanted to compete in the playoffs with them. The Sixers did finish two games under .500 at 69-71. But that isn’t necessarily an issue. Players get injured. Players get promoted and demoted. Winning really does take a back seat to player development. Look at what the team did in the postseason. The Sixers had to beat Rancho Cucamonga, coming from behind in the final inning of the decisive game. Then they beat Lancaster in the same manner, winning a 15-inning thriller in the decisive game. And that was a Lancaster team loaded with top-notch Astros prospects and heavily favored to win it all. To win the title the Sixers knocked off San Jose, a team that the Giants annually makes sure is loaded for a postseason run. The only good thing about this farce of a decision is it comes early enough Haselman and Emmanuel will both have no trouble landing jobs with other organizations. The Mariners would be a good bet for Haselman. Not only did he play in that organization, but he lives in the Northwest. He did some television analyst work there before going to the Angels and was very well received. The Mariners organization is in transition so that moves makes the most sense. 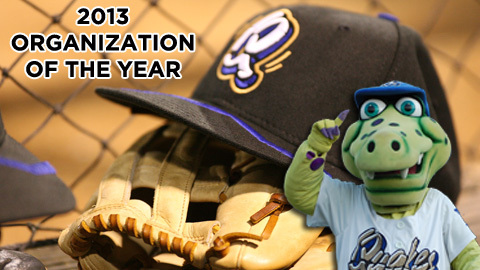 The Rancho Cucamonga Quakes have been honored as California League Organization of the Year. The annual award is voted on by all 10 teams in the California League and honors a “complete” baseball franchise that has demonstrated franchise stability and significant contributions to its community, league and the baseball industry. The Quakes will now represent the California League at this year’s Baseball Winter Meetings, where one minor league team will be named the John H. Johnson President’s Award winner, honoring the top organization in all of minor league baseball. The Seattle Mariners California League affiliate at High Desert will head into the 2014 season with a new general manager. Southern California native Ryan Cook has been appointed. Cook has worked with numerous professional sports franchises, most notaby the NBA’s Los Angeles Clippers, New Orleans Hornets and Sacramento Kings. With both the Hornets and the Clippers, Cook set new records for monthly revenues for ticket sales and new business development. Cook also has pro baseball experience, having worked for the Los Angeles Angels of Anaheim. Most recently, he has worked as an agent specializing in action sports for the Sports Syndicate in Newport Beach, California. An All-American Water Polo player himself, Cook led the effort to develop an Olympic division at the Sports Syndicate, cultivating relationships with Olympic USA volleyball players, Team USA water polo players, Team USA swimmers, and USA water polo, the sport’s national governing body. The announcement comes after the team and the City of Adelanto made major improvements to Mavericks Stadium in the spring of 2013. The Mavericks open the 2014 season at home April 3, against Inland Empire. Inland Empire outfielder Zach Borenstein narrowly missed hitting for the Triple Crown. 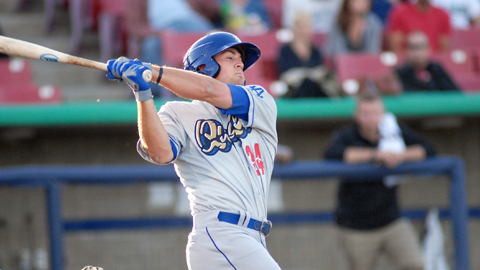 The Sixers standout finished with a California League-best batting average of .337. He also led the way in home runs (28), an unusual feat for a player whose home venue is the most notorious pitcher’s park in the 10-team league. He ended up third in RBI with 95, 12 fewer than Andrew Aplin of Lancaster who played 16 more games. He recorded career numbers in every offensive category except for doubles. (He had 22, three fewer than what he had last year). He made the midseason All-Star team and was named Cal League MVP just last week. Borenstein, 23, was not ranked in the Angels organization’s Top 25 prospects by Baseball America but one would think he’ll be included in that next year. Both California League honors went to players from North Division teams this week. 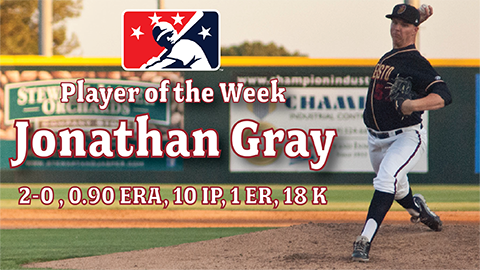 Jonathan Gray of Modesto is the Pitcher of the Week. He had two starts and gave up just five hits and two runs (one earned) with one walk and a whopping 18 strikeouts in 10 innings. After four so-so Pioneer League outings, Gray jumped to the Cal League, where he has been utterly dominant. The 21-year-old Oklahoma product gave up 15 hits in 13 1/3 innings with Grand Junction; in 24 innings with Modesto, he’s allowed just 10 hits while striking out 36. This was his second Pitcher of the Week honor in the Cal League. Mac Williamson of San Jose is the Player of the Week. . The third-round pick out of Wake Forest in 2012 hit .481 (13 for 27) with three doubles, four home runs, 12 RBI and 10 runs scored. Williamson has found his stride in the second half of his first full season. The 6-foot-5, 240-pound outfielder is batting .329 with with 15 homers and 49 RBI in 61 games since the All-Star break and has powered San Jose to nine straight wins. Williamson homered four times in six games last week, has an extra-base hit in eight straight games and multiple hits in five of seven contests. The surge has pushed Williamson into third place in the Cal League homer race with 24 blasts. Right-handed pitcher David Colvin of the High Desert Mavericks has been place on the disabled list by the parent Seattle Mariners. Colvin, 24, had appeared in 31 games, 30 of those out of the bullpen. He had a 5-0 record and 2.38 ERA in 56 2/3 innings. Those are pretty impressive numbers given the hitter-friendly California League venue in which he pitches. Colvin has not pitched since July 27 but was only recently placed on the disabled list. Colvin was a 27th round draft pick by the Mariners in 2011. His loss is big for the Mavericks who are trying to hold off Rancho Cucamonga and Lake Elsinore for the final South Division playoff spot with the season over in less than two weeks. Stockton and Lake Elsinore boasted recipients of this week’s Cal League Player of the Week honors. Player of the week honors went to the Ports’ Tony Thompson, who hit .429 (12 for 28) with three home runs, 15 RBI and seven runs scored. The 24-year-old Kansas plated nine runs on a 4-for-5 night Friday. He added another blast and four more RBIs on Saturday, pushing him into second place in the Cal League with 87 on the season. The Storm’s Johnny Barbato, 21, claimed Pitcher of the week honors, giving up three hits in six scoreless innings in his only outing of the week against Rancho Cucamonga. He struck out seven.